In the past I shared pictures of a number of famous magicians homes. But there is one that I was not aware of until recently. 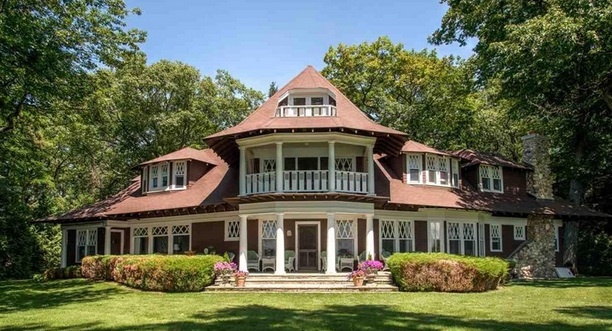 The house was built for Edward Maro, The GREAT MARO and is located in Leland Michigan. It's sits on the shores of North Lake Leelanau and it's breathtaking to say the least. With any luck, I'll get to see the house in a few weeks as I'm traveling to Michigan to perform in a theatre named after Maro. In fact, I'll be presenting a lecture on Maro while I'm in town as well as doing two shows. Once the lecture is done, I'll do a nice bio piece on Maro for the blog and hopefully will have a new episode of The Magic Detective Youtube Show to debut. Wow, this is truly magical house!! I am in love with this villa. I wish this home would have located in Arizona. Anyway, I just got to know that such beautiful homes are also available in Dove mountain real estate. Is that true guys? Dean, I spent my whole childhood exploring this house. It's huge and creepy. My Grandmother bought it from the second owners and stayed there every Summer. She passed away in 1996 and the property was broken up and sold off. It's nice now, but very different from what it was. We have many photos of its past glory if you'd like to see them. Jim, SURE would love to see the photos you have! Thanks!